GBA Mega Man Battle Chip Challenge (USA) "best ending" in 2:41:48.8 by mtvf1. 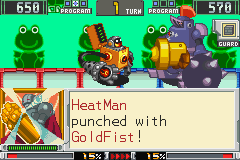 Mega Man Battle Chip Challenge is an offshoot of the Mega Man Battle Network series of Mega Man games. While not the most popular game in the series, it offers many opportunities for TASing, with lots of luck manipulation and route planning. This run by mtvf1 plays through the game speedily and gets the best ending. See the author's comments for a detailed analysis of some of the strategies and routes used.